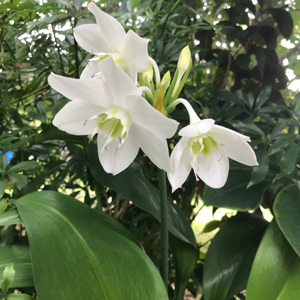 A shade loving plant from South America, Eucharis Amazon Lily (Eucharis x grandiflora) displays fragrant vivid white Daffodil-like flowers with a delightful green centre above large glossy green foliage. Eucharis requires a warm humid position (18-23 degrees) for best growth so is better suited to the more tropical parts of Australia. This evergreen bulb will flower during the warmer months, often in response to watering patterns. 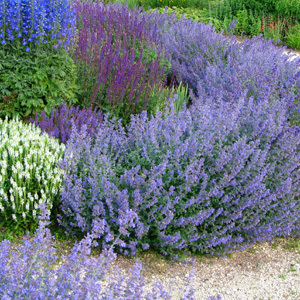 In cooler climates force plants to become dormant for a short period in Spring to encourage flowers; in warmer climates plants should flower naturally. Eucharis will grow well in a warm sheltered position in a moist rich soil and will also grow well indoors in a pot. Use a good quality potting mix and fertilise in Spring. Dislikes being disturbed so repotting is only neccessary every 3-4 years, and Summer is the best time for this. Protect from slugs and snails, and can also suffer from aphids, mites & mealybugs so a regular spray program is recommended.